Amazon is working on plans to open hundreds of brick-and-mortar bookstores, according to a new report from CNBC. 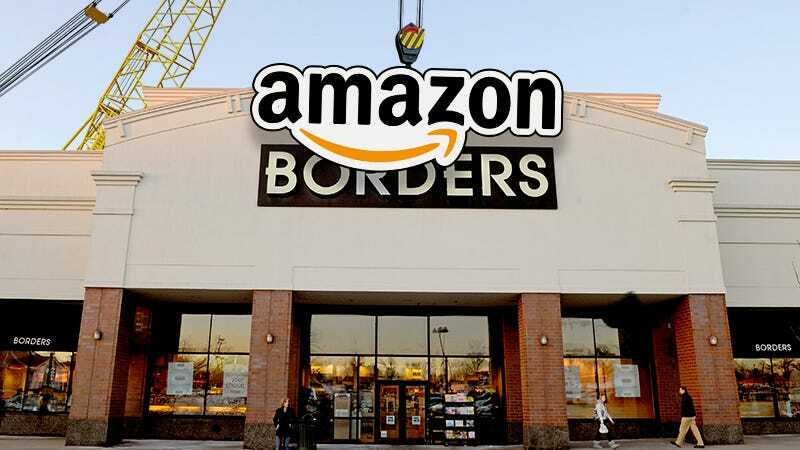 Yes, following in the footsteps of chains like Borders, Amazon apparently thinks that the future is in dead trees. Amazon already has one physical store that opened back in November. The Seattle store was dismissed as a “vanity project” when it was first announced, but apparently it worked out well enough that Amazon is willing to bet big money on it. It ain’t cheap to open 300-400 retail stores. Update 5:55pm EST: An Amazon spokesperson has told Gizmodo that they don’t comment on rumors and speculation. The original source of the report appears to be a mall executive for General Growth Properties Inc.
Update 6:25pm EST: Anonymous Amazon sources are somewhat angry about the reports, which come from a non-Amazon CEO, and are calling the entire story (this one included) “misleading.” Gizmodo has repeatedly asked for on-the-record denials from multiple sources within Amazon and been denied. Update 6:43pm EST: Anonymous Amazon sources are particularly angry about my last update. Update February 3rd, 4:12pm EST: CNBC is now reporting that the mall executive, Sandeep Mathrani, who said Amazon would open “300-400" stores has released a new statement saying his comments “don’t reflect Amazon’s plans.” It should be noted that the New York Times confirmed yesterday that the plans for physical stores were simply more “modest” than 300-400 physical locations. The current anger levels of anonymous Amazon sources could not yet be confirmed. Update February 3rd, 5:17pm EST: Re/code is now reporting that Amazon’s brick-and-mortar retail initiative is real and being managed by Steve Kessel, an Amazon exec who helped launch the first Kindle. Re/code has a bunch of new details on the initiative, which is called Amazon Books. According to CNBC, Amazon will attempt to sell books at the same price that they offer online, which is particularly amusing given how Amazon spent the past two decades driving booksellers like B. Dalton, Borders, and Waldenbooks out of business by undercutting their prices. Physical bookstores quickly turned into showroom floors where people would browse and then go buy books for cheap at Amazon. There’s no word yet on how much money Amazon will allocate for their physical stores, nor which cities will be graced with an Amazon (& Noble?) retail location. The only thing we know for certain is that life is silly sometimes. And that the retail business is baffling. We can’t wait to see Netflix open up laserdisc rental shops next.